Contemporary and unique sculpted design in classic colors with a premium non slip long wearing backing. Platinum: Anthracite dark grey with hint of blue and a medium tone platinum grey are the dominant colors. 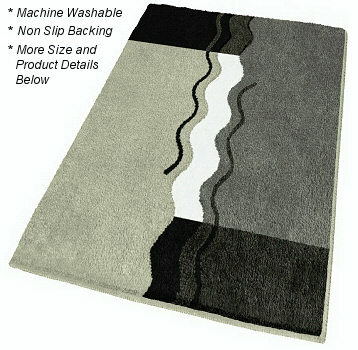 The rug is accented with black and slate grey with snow white in the middle. Coordinated Lid Cover: Solid Black. Brandy: Brandy earthy deep orange and a medium tone orange are the primary colors. The rug is accented with tomato red orange, chocolate brown with light peach orange in the middle. Coordinated Lid Cover: Solid Brandy - earthy deep orange. Palm Green: Medium tone grassy green and a very light spring green are the dominant colors. The rug is accented with moss green and medium tone yellow green with light yellow in the middle. Coordinated Lid Cover: Solid Palm Green - medium tone grassy green. Fawn Brown: Soft brown and a light taupe brown are the dominant colors. The rug is accented with espresso brown and a mahogany brown with light a cream tone in the middle. Coordinated Lid Cover: Solid Fawn Brown - medium tone soft brown. Elongated lid covers for the Vanessa design are solid colors and are coordinated as stated above in the color descriptions.